Also acquired through government surplus, Squad 58 is utilized for manpower transport. 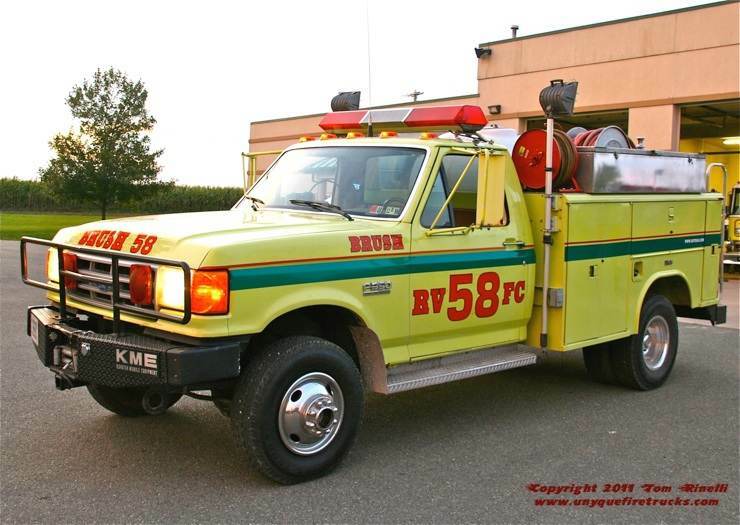 Brush 58 - 1990 Ford F-350 4x4/Reading/KME 180 gpm/225 gal. Acquired through government surplus, this rig began life as a military P-20 twin agent crash truck equipped with a chemical skid unit. 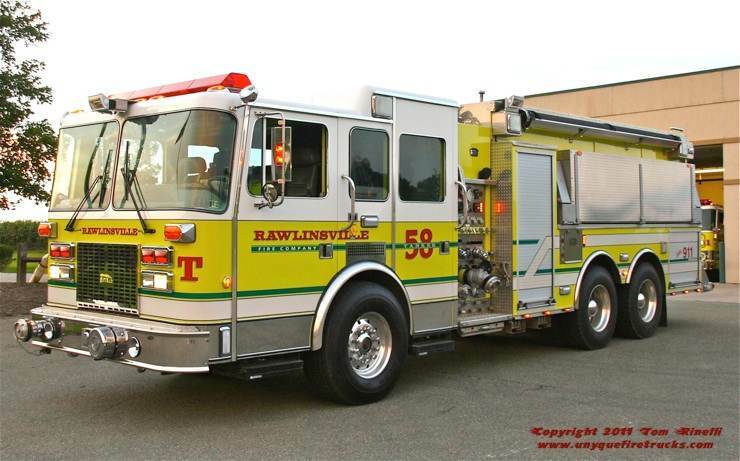 Already painted Lime/Yellow, Rawlinsville simply added a pump panel, mobile radio & wheel covers to convert this rig to meet their needs. 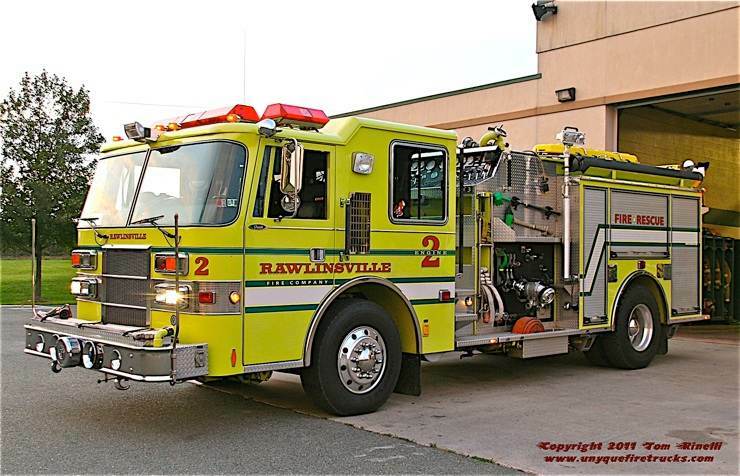 Organized in 1952, Rawlinsville provides Fire, Extrication & Water Rescue services to a 70+ mile response area encompassing Martic, Providence, Drumore and East Drumore Townships. Forty active volunteers including members of the Amish farming community they serve answer an average of 300 alarms annually. Originally serving the Wilkins Twp. FD outside Pittsburgh (PA), this rig entered service in 2007 and replaced a 1975 Mack CF/SWAB engine that formerly served the Eden FC. Featuring a short four door cab enclosure, it was already painted in the company’s color scheme of Lime/Yellow with a Dark Green stripe. Seating six (5 with SCBA), it is equipped with four pre-connects, 400’ of 3” supply line, 1,000 of 5” LDH and 500’ of 1” forestry hose. Like Engine 581, it also operates Centaur hydraulic extrication tools acquired through government surplus. Engine 581 - 1998 Seagrave 2000 gpm/1000 gal. 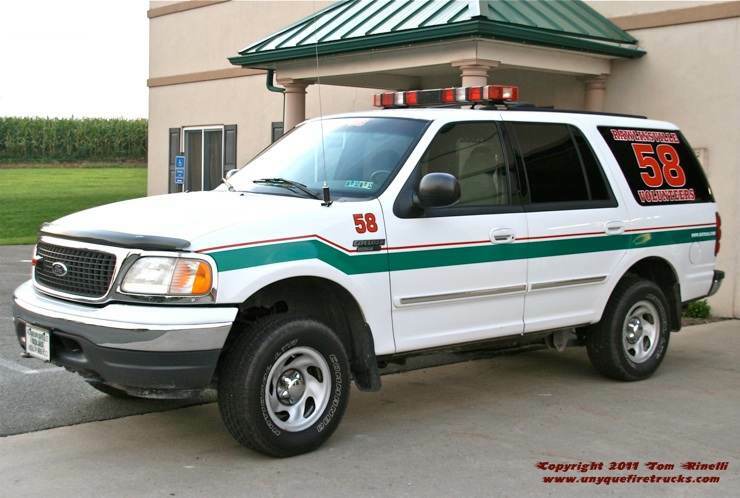 The only active front line unit that was purchased new, this rig seats eight (5 with SCBA). It is equipped with a pre-connected Blitzfire monitor as well as a Lukas power unit supplying Centaur extrication tools acquired through government surplus. Tanker 58 - 2000 Spartan/FireFab 1750 gpm/3000 gal. 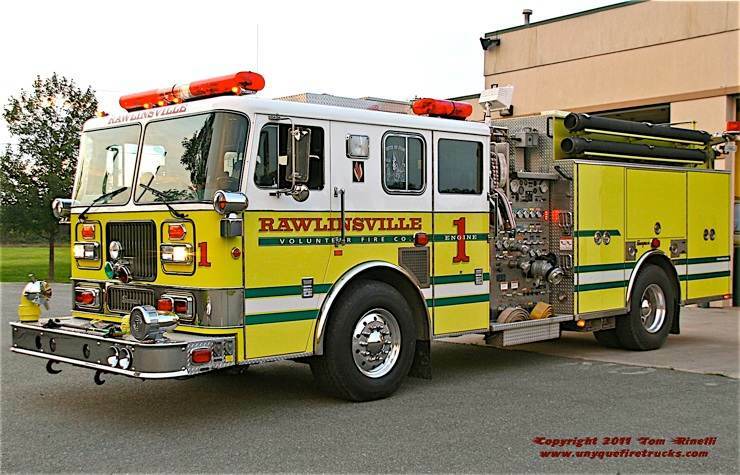 Also entering service in 2007 (and also painted in Rawlinsville’s colors), this rig originally served the Cronomer Valley (NY) FD. Seating six (all with SCBA), it features a back-up collision avoidance system, an around the pump FoamPro system, 10” side/rear electric dump chutes, side/rear LDH intakes & discharges as well as hydraulic ladder & folding tank racks. Equipped with 1,000’ of 5” LDH and three 14’ hard suctions, Tanker 58 has been unofficially voted “baddest tanker” east of the Susquehanna at many area parades. Special thanks to Chief Engineer Dennis Drennen Sr. & FF Kevin Evans for their assistance in positioning the rigs for photos and providing background information on the department & its’ apparatus.